Two of the things I'm totally addicted to now, the iFontMaker app for iPad and Disney/Pixar's Inside Out. So I've decided to marry them. For those who don't know, iFontMaker is an app that allows you to draw your own fonts. The website says you can draw a font in 5 minutes. This is probably true for some people, but I'm Type A and complicated when it comes to anything creative, so for me, it's often the equivalent of five days. The font that appears on the web version of this site is my handwriting. This font was probably redone, oh, six or seven times. I have various fonts I've created for the purpose of one-key shortcuts (for example, a private signature font I use at work to sign PDFs), fonts of cartoons of my family just because I ran out of ideas, chalkboard fonts, fonts to make diecuts for my Cricut (also in the top five on my current addictions list) and of characters my kids love. That's where Inside Out comes in. Inside Out is easily one of the best family movies I've seen in a long time. It has unseated Frozen as far as the Pop Culture Girls' obsession meter goes. You heard me, Disgust is more popular than Elsa. Seriously. 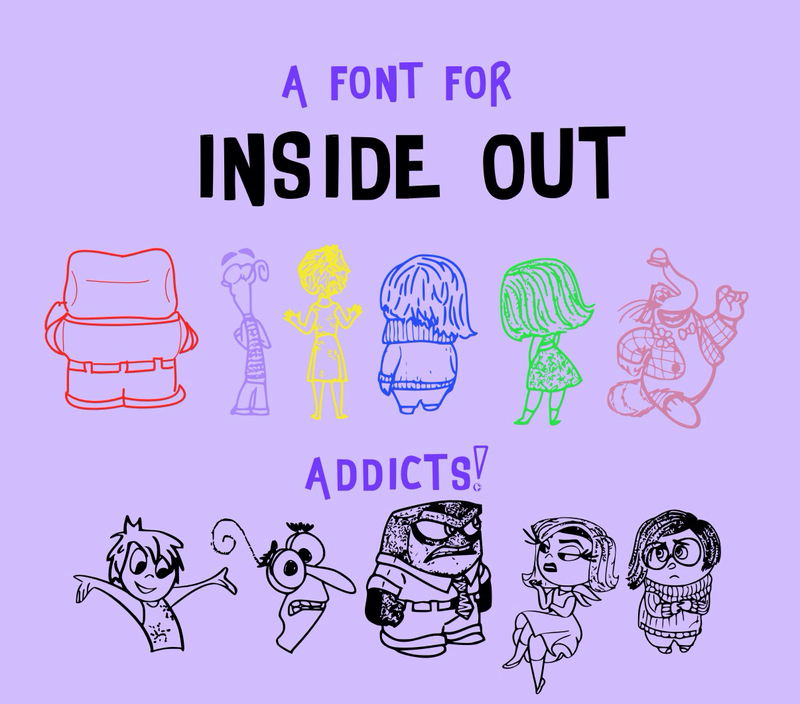 So after we saw Inside Out the first time, I started working on a font. I'm not exactly sure what we'll do with it other than using it in the Cricut and basically just randomly inserting it in documents just because we can [fan art made easy! ], but my kids were super excited when I finally finished it today. I'm not selfish, so I'm sharing it with you all. All I ask is that you let people know where you got it. So Inside-ish Out-like is all yours for the low cost of attribution. * Just click here. I hope you experience lots of Joy and make Core Memories using it! * And it should go without saying, but DUH! no commercial use! Personal use only.